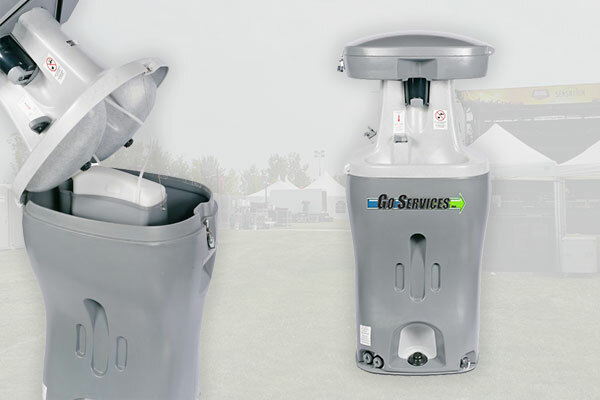 Portable Hand Washing Stations | Special Event Rentals | Go Services Inc. Outdoor events propose a unique set of circumstances for your guests. Aside from our typical rental options, we also have Portable Hand Washing Stations that are both compact and useful. At Go Services Inc. we are consistently looking for ways to better suit your Special Event Rental needs. Available in any quantity you need, these units will help your crowd stay clean during any event. Fully Stocked. – soap and paper towel come included in all of our rentals. 300+ Uses. – our units come stocked and ready to work for the duration of your event. Designed Sturdy. – we will deliver and setup your Portable Hand Washing Stations. As well, we make sure that each unit is tied down properly in case of alternate weather conditions. Whether you are booking Wedding Rentals or simply for a Commercial Event – we have you covered! With a host of other options available, think of Go Services Inc. as your one-stop shop for all your equipment needs. Our Fleet model offers 24% more floor space as well as a unique corner tank. We reserve these units specifically for events and weddings, and are sure to never use them on industrial sites. Modern, Contemporary, and sure to impress! Coupled with running water, flushing toilets, heat and lighting. See more about our Executive Restroom Rentals. We also offer Portable Urinal Rentals depending on the needs of your event. Let us take care of your Restrooms and Portable Hand Washing Stations for your next event. With over 14 years of experience in Equipment Rental & Services we are confident we can provide proper recommendations and top-quality service. Feel free to use the Quote Form below, or else give us a call at our Toll-Free Number: (855) 342 9950.